Our Sports Day was a huge success this year. Please check the full photo album on our website through the Photo Gallery Page. We were delighted to host a visit from the British Ambassador on Monday 18th February. Sir Geoffrey Adams KCMG met with various staff and had a tour of the school meeting students and was very impressed with the school. We would like to thank him for taking the time to visit us. In Science Club we were looking at the properties of custard when mixed with water. It is an unusual material because it can be a solid and a liquid at the same time. First we discussed that custard powder is a solid material because it doesn't take the same shape as its container and then we mixed it with water. If we stirred quickly it turned into a solid and if we left it or stirred slowly it became a liquid. As with every year, we have another group of our students who have achieved national awards for their examination performance. We are very proud of them. 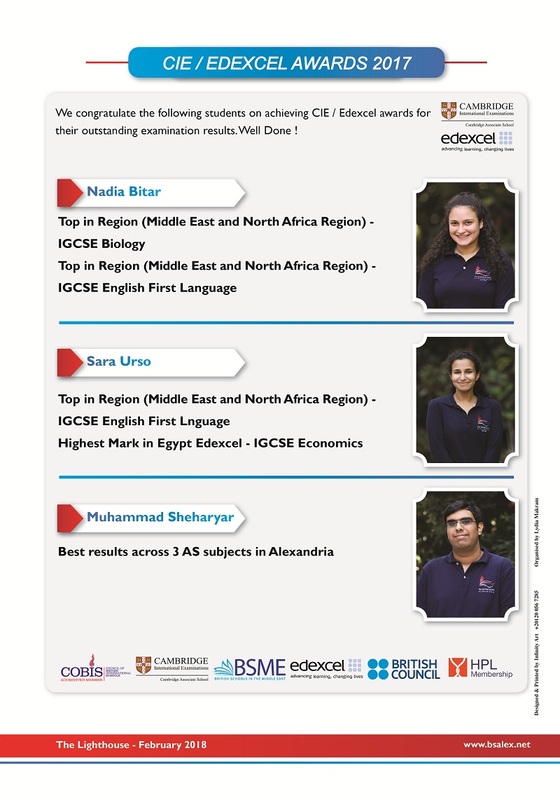 Haya Kassem – Top in Alexandria for First Language English and Top in Africa for Edexcel IGCSE History. BSA Friends of School 5th Gala Dinner held at the beginning of October was nothing short of a spectacular success this year and in every way a golden evening. We are very grateful to Her Majesty’s Consul General, Ms Wendy Freeman, for kindly hosting the event in the Consulate Garden. We also had a very special guest this year, the Egyptian actress, Nada Bassiouny. Book week 2018 was a hugely successful week which focused on poetry and performance. All children in Prep and Pre-prep learnt a poem by heart, with the older children performing their chosen poem to their year group and, using specific success criteria, assessing each other. Children then voted and the best of each year group recited their poems in our Book Week assemblies. Alongside the recitals, many competitions took place, including ‘guess how many books are in the library’, a design a bookmark competition and an extreme reading photo challenge. Students this week have been using Google Cardboard and VR apps to look at how VR can change our lives and potential uses for it in the future. Students were making 360 walk throughs of where they live and where they come to school. Y10 students gave Y8s a lesson on using BBC Microbit Computers, which was really fun. Students Yassein, Lina, Mohamed, Mariam and Bahira demonstrated good CS knowledge as well as great leadership skills in planning and delivering a lesson using technology new to the BSA. In Pre-Prep we had a great International Day! FS1 learnt about Italy and FS2 learnt all about Cambodia by participating in different activities in each class. In KS1, we went all around the world and visited Scotland, the UAE, Australia, England, America, Italy and France! For lunchtime, we had lots of fun and really enjoyed our shared buffet at Heron Campus organised by the FOS.